← Gross me out Thursday! Les bines blanc is bayou speak for the white beans. 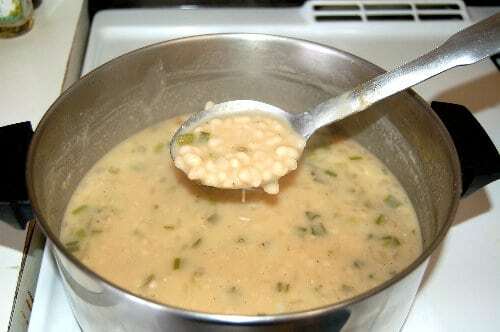 Any bayou cook worth her salt can cook up a pot of savory white beans to go along with just about any main item. These are not just any white beans, though. 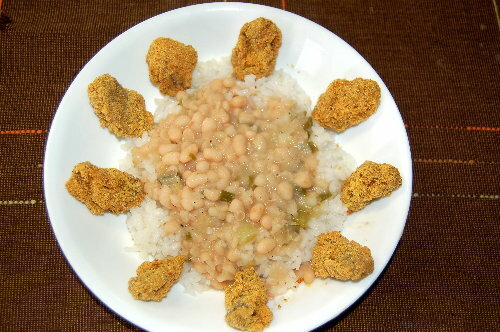 These are the kind my mother-in-law makes and I have yet to find anyone–Native American, Cajun, French, or otherwise–whose white beans stand up to hers. SIDEBAR: She is now 93 and still cooks them better than I! Because bayou families are typically large, the meals are budget stretchers and tummy fillers and just downright basically delicious. Over the years, I’ve created a few shortcuts and updated her recipe a little; and I will tell you blow by blow where I have taken those liberties and why. Hang on to your spoons, because here we go with the boiling of les bines blancs . . .
You have a choice of fats in this recipe: olive oil, vegetable oil, or the oh-so-flavorful-and-artery-clogging bacon grease that you will brown your onions in. Along with learning how to cook bayou style, you will learn our cooking terms, too. We do not saute–we brown. Gee, wonder what the kettle is for? Every good bayou cook keeps one on the stove at all times. Both the kettle and the 6-quart stainless pot are coming to a boil . I use Camellia brand great northern beans, but any brand will do. While your water is coming to a boil, you are at the sink sorting out the ugly beans and the little rocks and pieces of dirt that somehow escaped the culler’s sharp eye and giving them their final rinse. Chop your two onions. But don’t chop the green onions. I just threw them in this photo because I forgot them in the original ingredients photos. Sorry. By this time, the kettle is boiling, so turn it off and move it to a back burner. It will stay hot for a while. Pour your clean beans into the boiling water, leaving the fire on medium-high. You want the beans to boil again. 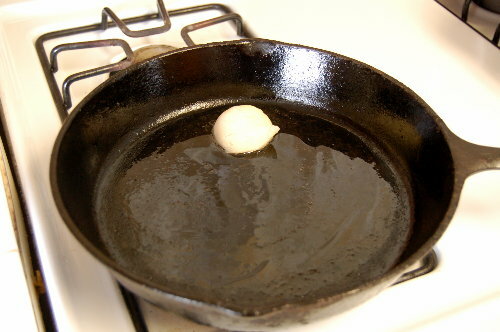 In your favorite browning skillet, add a dollop of the fat of your choice. I choose bacon grease. This is one of the recipe changes I was telling you about. My mother-in-law uses salt pork, which she boils and browns before adding to the bean pot. This gives the beans a distinctive flavor, and some folks like to eat the salt pork. Because I am so health conscious (not), I use the bacon grease to give my beans pork flavor without all the work, I mean pork. Okay, so it’s a shortcut choice and not necessarily a health choice! Here’s where we are. The onions are browning while the beans are boiling. Go ahead and stir them. You know you want to! Let the beans continue to boil on medium heat, stirring often. 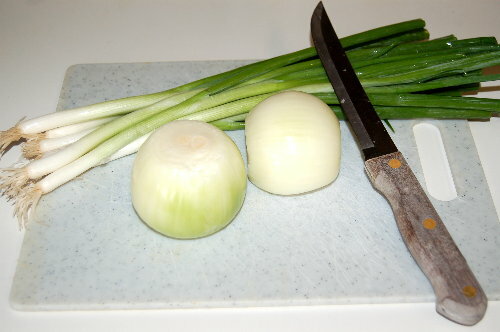 While they cook, go ahead and chop your green onion tails. That’s right. I said tails, because that is the literal translation of the local word for those green tops. We call them les tcheues d’oignon or “tails of the onion”. When the water cooks out about this much . . .
grab that kettle of hot water and add some more. The beans have been boiling about 45 minutes at this point but are not cooked soft enough yet. A good bayou cook always adds hot water to the recipe to keep things hot as you go. Also, I’ve been told that adding cold water to the beans at this point causes them to break or fall apart. You don’t want that to happen. Lower the fire to medium/low, and of course, stir to your little heart’s content. You know they are about 2/3 of the way done, when the water looks milky like this and the beans are getting soft. Now, turn the fire to low and . . .
add the green onion tails, 2 t. salt, 1 t. pepper, and 1 t. Cajun seasoning (or use all seasonings to taste). The more you taste, the better the beans! Now, I am about to reveal to you the secret of why my MIL’s beans are better than all others—-the sauce. When the beans are fully cooked (and they are intact and not in pieces, because we used hot water) she uses the back of her spoon and smashes the beans making the liquid very creamy. Stir these scrumptious beauties a couple more times, and then serve them on a bed of your favorite rice (which, by the way, the bayou people know forms a complete protein) and garnish with a delectable side like, oh I don’t know, maybe fresh-from-the-shell fried oysters? Allons manger! Let’s eat! It’s been great sharing this very old bayou recipe for les bines blancs with you today. We might eat this same dish for the next three days–or until the fresh oysters run out!! Bring the pot of water and kettle to a boil. Sort through beans for any little rocks. Rinse. Add the beans to the pot, bring to a boil again on medium-high. Drain beans and using water from the kettle, refill bean pot and bring to a boil again. Refill kettle with water and bring to boil to use later. 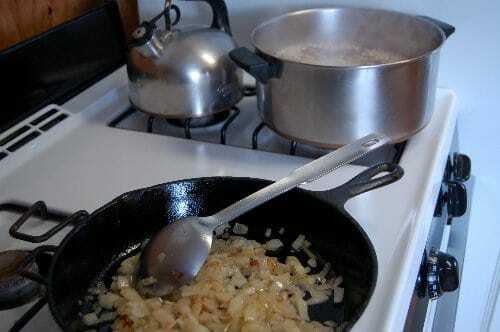 Add your grease to a skillet and brown the chopped onions. 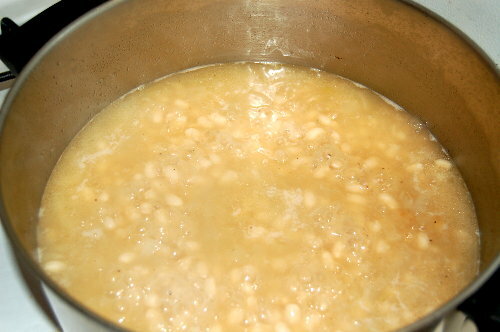 Add the onions to the beans and continue to boil on medium heat, stirring often for about 45 minutes. 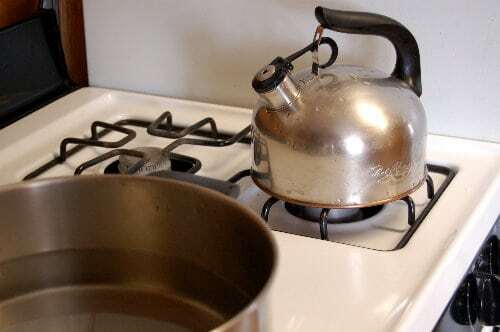 Some of the water should have boiled out, so add some hot water from the kettle. Lower fire to medium-low and stir occasionally. When the water looks milky and the beans are getting soft, lower the heat to low. 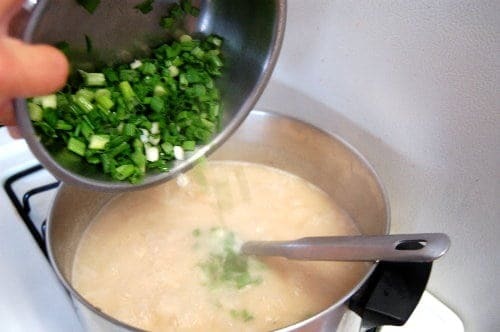 Add the green onions and seasonings. 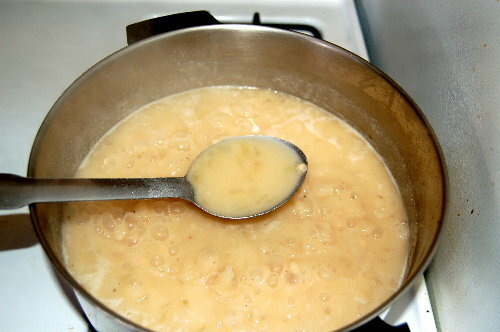 If the liquid seems too thick and the beans are not yet soft, add more hot water and cook on low until soft. When the beans are fully cooked use the back of a spoon and smash some of the beans, making the liquid very creamy. I can’t wait to make this (sans the oysters), but ah’d like to know how to pronounce all them thar frenchie words! I make the same recipe (you use small ones?) except for the boiling part. I find the beans release there hull at this point. I don’t like hulls swimming around so I simmer them (no boiling, ever) on a low fire. BTW I love bacon grease……just a little bit goes a long way. Heart healthy….not. But yummy and can’t be replaced in flavor. Well, Heather, I’ll just have to work on a pronunciation guide, won’t I? Tabasco? Ah yes, I should have the bottle sitting right next to the plate!!! We add our favorite hot sauce to the beans right before we eat them! Yes, Kaye, these are the small navy (peas) beans. We often find them locally grown sold in the grocery stores, but I used a package brand for the sake of those who can’t get them locally. Love white beans plated right next to jambalaya or fried speckled trout or catfish! my metaphysical aura recharges there so…. Miss healthy Du as I say not as I Du, shame on you darling. beans. Internet searching will find that they have an enzyme thing the inhibits glucose absorption. Healthy boogers anyway. I use a bit of real ham and and a bit of Savoy Andouille. Brown in pan with bunch of parsley (healthy stuff 2) then onions and celery and garlic maybe some green pepper then black pepper and Crystal to taste. If little too runny I toss in some rice. Stuff rocks so the sacaulait get released and I eat this. Welcome to the site, Doris! Good luck with your bean cooking and gas testing! Please come back soon! Ok. Got some bean questions and figure this is as good a pot as any to stir. First, where is your red bean recipe? Second, maybe this is a dark secret or maybe it is me but…. About a third of the time I make beans which tradition says are better second day, the second day they have developed a smell I can’t handle. Is it the beans or the aromatics like garlic? Very confused as they seem good first day. First off, I have not posted a red bean recipe, but you can’t mess them up. Buy the bag, read the directions, add the proper seasonings and “boil baby boil”!! 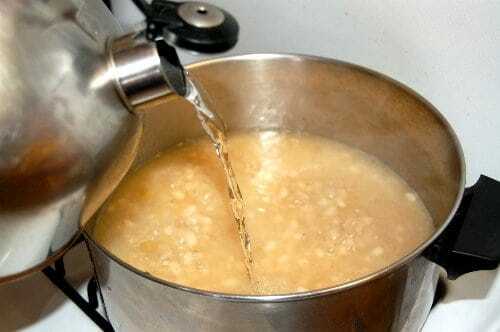 If you don’t throw out the first boiling water, put fresh water and boil again, then the smell will be strong the second day. That is a Bayou Chef secret!!! Ok will work on it. I like the white kidneys better anyhow. Why do I feel like I have woken up in the past? Not everyone has seen this recipe, Miss Smarty. At least I didn’t delete the comments and try to pass it off as new material. Give BW a break. You know what? I would have expected that from Blu, but not you. Now, go back to bed and get up again in the present!!! Just getting back at you for ruining my perfectly good granola dinner last night! That is pretty much how my Mom used to make them, as did my grandma too I believe. Clint likes to use the potato masher to make them creamy but I just use the spoon! Yep, the potato masher does a good job! Oh yum! This looks delicious. And simple too. I’ve made white beans before but this recipe is a little different. Got to give it a try. I usually use a hambone–is that something you do too? No hambone, Sue, because that gives a different taste. In the original recipe, my mother-in-law used “salt meat”. First she boiled it, then she fried it, and then she added to it to the beans to boil until soft. That’s a different taste altogether, though from the same animal! My husband has gotten used to “no salt meat” over the years and has settled for the subtle flavor from the bacon grease. I think I’ll be doing red beans n rice ala Sara Roahen tonight. Writer of Gumbo Tales and recent mom and blogger too. O yeah got me a nice 17 plus saugeye gonna hit the skillet too. Cold n rainy here. They are biting. I’m all for recycling, but I want to see something new too. Oh, I guess we’ll have to forgive you ! We know you’re still playing surgeon/nurse to the kitten. How’s he doing? I showed Hubby yesterdays post. He said the same thing I did. Never heard of a Botfly and then we see it twice in a matter of weeks. Steffi, you know it hurts me when you complain. It will be weeks before I can be inspired to cook and post something new now. Darn you. PS Kitten is not well. I’m not complaining! I’m begging for new recipes! Seeing that photo of the oysters made my mouth water. Fried is the ONLY way I like oysters, and then I want then small and “over cooked” by restaurant standards. Oh yea, I hate big juicy oysters!!! LOL! As usual for your cooking osts – this looks delicous! BW, I cut all big juicy oysters in half before cooking them. It’s me, it’s weird…it’s a “head thing”. I just can’t stand to see the uneaten portion. It looks disgusting. Got to be bite sized!!!!!!!!!!! I lubs me some beans, red beans is Monday, white beans is Wednesday, Friday is seafood. I use Snowdrift Lard. But its added at the end. Here on the river the folks all do a parboil of the beans for 15 mins with a Tablespoon of baking soda. Then rinse and rinse well and then start cooking your white beans. That will remove all the “bean skins”. I guess its the only place besides ettouffee, that they use the white end of the green onions here. Its all a locality thing. I never had beans and rice that weren’t my favorites. BTW I always heard two different ways to remove the Flatulence. 1. Is to add to coco~cola, the other is to cook ’em the day before and reheat them. Personally that is like drinking beer and not expecting to pee. Whats the point of beans without that special, “aire of distinction”? Mmmmmm………… Oysters…… I don’t get ’em fried too much, they don’t last that long. A cold case of beer, a full sack of salty oysters, how can you expect anyone to wait. Not going to clear 40 degrees here by noon, the humanity. I sure wish the happy folks in the south would send me a natural gas gift card from FEMA. Neighbors heat their house with wood so we get to smell the stench of elm and box elder burning all winter which ain’t for a couple months yet. Bright side? Red beans on stove zip for wind so be out later chasing fishies. Foamheart, more fiber not less in diet. What are you thinking? Rice bran for everybody. It was an Omen! This morning before church I went to the grocery store. They were putting OYSTERS out in the seafood case! I’ll give y’all 3 guesses (and the 1st 2 don’t count) what we had for supper tonight! My wife asked why you messed up the beans by putting onions in them … she doesn’t like the taste of them in the beans. I’ve never tried it. So I will have to do it at least once to see what I think. I just love white beans! Great Northern, Navy, Kidney, Lima (butter), Pinto, everything gets some onions (green tops, white bottoms, Vidallia, Aggie 1014, chopped, minced, cruched, pressed). Some get a little bell pepper, or celery, garlic, or tomatoes, mix and match, or none of the above. Add some sausage, Andouille, tasso, chicken, pork, seafood, you can’t make a bad pot of beans. If they burn, there is no way to save ’em. Its like a roux, burnt beans taste bad. My sister can, but she burns water. If it doesn’t come out a take out window, she does not recognize it as food. Sauteing the onions first is not the same as adding raw onion to the pot!!! I’ll try not to be offended by her comment! You’ll love them, I promise! This post leaves me starving….and I tried going to the store this afternoon. Actually I made it Albertsons but got totally drenched by heavy rain. Even you food photos are artful! Hope this tropical rain storm stops in southwest Louisiana! But at least it is not a hurricane. I just found your website, and I think it is great. I will be having shrimp boulettes with white beans and rice tomorrow. BYW, it seems like pork fat in all its forms is getting a bum rap, healthwise. I wonder how much of that stuff your 93 year old MIL has eaten in her Cajun lifetime? Hi Roy, and welcome to this bayou site!! Oh Lord, she has eaten a ton!!!! She’s now 95 and just had her gall bladder removed last week . . . guess it finally caught up with her. They don’t make parts like they used to . . . many folks nowadays get theirs removed much sooner! Right? Good luck with the cooking and I hope it goes well. Where are you from? I’m Louisiana born & bred, but living in Colorado. I discovered this website several years ago and I love it! This recipe is now my go-to. I’ve been using this method for all beans I cook. Thank you so much; these beans are the best! I like to serve them with fried catfish, shrimp & oysters (when I can get them). What I wouldn’t give for some ripe Creole tomatoes to serve on the side! 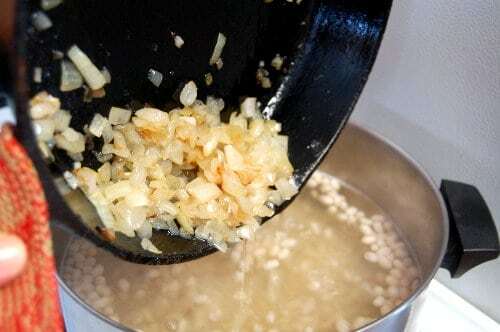 Here’s one for you…I recently was visiting a towboat in Houma and the captain made a pot of white beans and corned beef. He called it a french name that I can’t recall. Have you ever encountered this dish? Any thoughts on recipe? Please email me if you do….the dish was very distinctive and a new way (for me) to prepare my beloved white beans. I hope you can help.